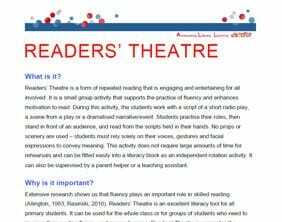 Readers' Theatre is a fluency Powerful Practice that is designed to provide an authentic and engaging context for developing expressive reading skills. In Readers' Theatre students work in groups to read aloud scripts on topics of interest. These scripts can be sourced by the teacher or the students may write their own. While practicing for a RT performance, students develop familiarity with content material as they build oral reading skills and automatic word recognition. Readers' Theatre can be a great way to engage readers who are struggling to see a purpose to reading.